Who enjoys contacting HMRC? Not me that's for sure! But sometimes we need to, and it can be quite difficult. It's coming to the end of the financial year and some of you may be thinking about doing tax returns (yawn - but necessary), you may be wondering if you have paid too much tax (always me, praying and hoping that I have), or you may just want to get in touch with the HMRC for some reason or another such as benefit claims, child tax credits, change of circumstances etc. My experience of contacting the tax office/HMRC has usually been pretty poor, whether that's trying to get through to the right department, even trying to find a direct number to the department you want to speak to can be extremely difficult, or just wanting some general information but not being able to find it on the website at all - or in my case, simplified!!! 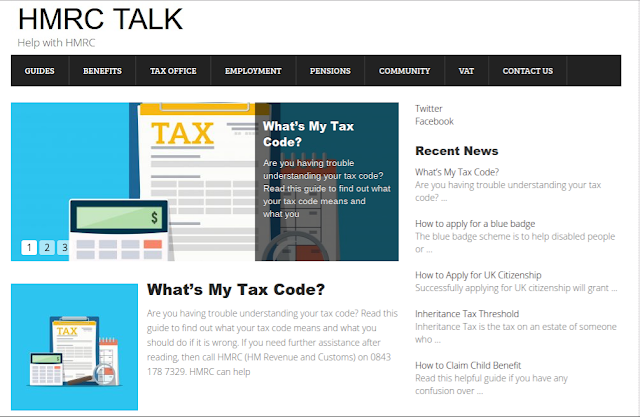 This website is super useful for everyone, it includes loads of information, such as querying your tax code, how to claim maternity pay, employer responsibilities, how to buy a council house and much much more! I have found it so much more simple than using the GOV.UK website directly, plus it's much easier to navigate. What is your experience of contacting the HMRC? Would you use a website such as Talk Tax?